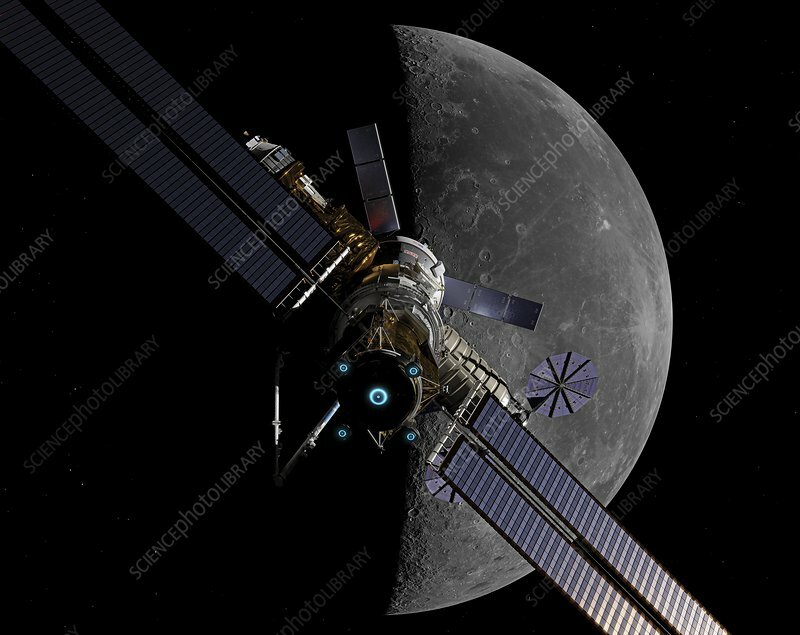 Illustration of the proposed Lunar Orbital Platform-Gateway, a manned moon-orbiting space station. A manned crew exploration vehicle (CEV) is docked with the space station. At the centre of the space station is the manned habitation module. Attached to the habitation module on the right is a Cygnus Enhanced automated cargo spacecraft. Attached to the habitation module on the left is a JAXA H-II Transfer Vehicle (HTV) automated cargo spacecraft. At the far end is the crewed capsule and service module, or Orion Multi-Purpose Crew Vehicle. In the foreground is the ion propulsion module, or Power and Propulsion Element. The round bluish glows are discharge columns of low-density plasmas visible when the ion propulsion thrusters are active. The solar voltaic panels have a total length of 53 meters.